If you ever want to simplify your skincare routine then cold pressed oils are a great starting point. From the perspective of someone with sensitive skin prone to eczema, oils can be an excellent way to scale back on products to help restore balance from flare ups. They are budget friendly, reduce plastic waste and multipurpose. One of my travel tips when packing light is to opt for multipurpose oils, you could skip cleanser, moisturiser, body cream and hair conditioner in favour of one good oil alternative. You might be wondering what “cold pressed” means and it refers to the method of extracting oils from seed/fruits. They are pummeled and squeezed but no external heat is introduced to fuel the process. It is believed that cold pressing is better than heat extraction because retains natural properties such as purity, flavour, fragrance and nutritional value. 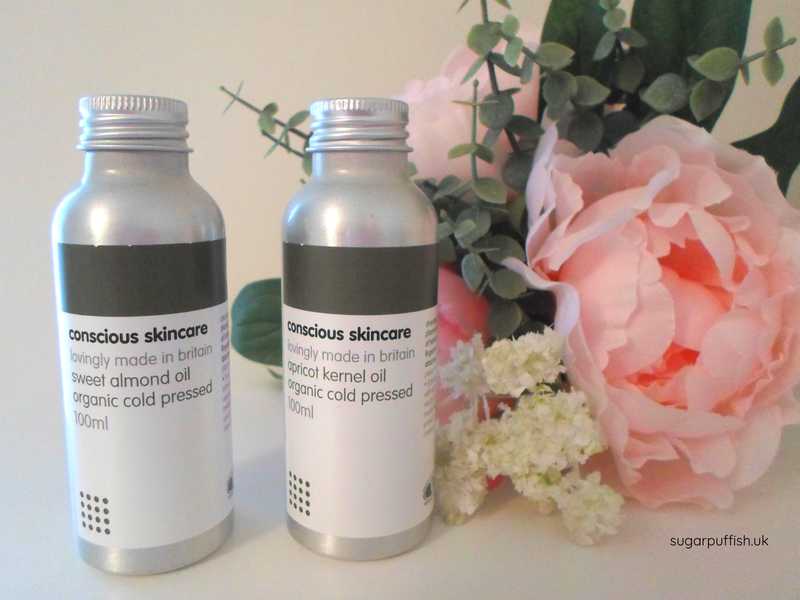 Conscious Skincare is a brand I’ve featured many times on my blog and part of their product range includes cold pressed oils. I accepted Apricot Kernel and Sweet Almond Oil both of which are ideal for sensitive and dry skin. I’m already a huge fan of Apricot Kernel oil and it’s been a go to for many years. It’s high in oleic acid which means it can be easily absorb by your skin. I enjoy using for cleansing and moisturising because it packs a punch but feels lightweight. Whenever my skin is flaring from eczema or allergic reaction, I’ll immediately turn to apricot kernel for relief. I find taking my skincare back to basics is the quickest way to settle my skin. Under these circumstances I’m looking to reduce my exposure to complicated formulations and essential oil allergens. Sweet almond oil is new to me in the sense of not experiencing it as a standalone ingredient however it is one I look for in formulations because it’s an excellent skin protector. It is high in vitamin E which can be beneficial to dry skin including those prone to eczema and psoriasis. This is one to soothe irritated skin and reduce itching. As with apricot kernel it’s multipurpose and I’ve been using to cleanse and moisturise. It works well for both tasks and I like how my skin feels after application. Both oils don’t have much of an odour but almond is marginally stronger with a nutty scent. Apricot Kernel and Almond are just two of the cold pressed oils available from Conscious Skincare; you can also buy Abyssinian, Argan, Evening Primrose, Hemp, Jojoba and Rosehip. Full details are available on the website to help you select the right oil for your skin type. Alternatively, I have a simple guide in the archives - What are the best oils for your skin type?